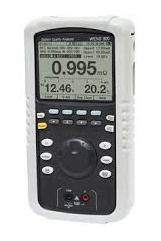 » The Battery Quality Analyzer is designed for measuring the internal resistance, opencircuit voltage, and terminal temperature of secondary batteries, including Lead Storage Cells (Lead -Acid batteries), nickel-cadmium batteries, lithium-ion batteries and nickel-metal hydride batteries. » AC four-terminal method to measure the internal resistance by eliminating lead resistance and contact resistance to get the accurate results. » Dual display to show the internal resistance and voltage of the battery simultaneously. » It has 99 sets of composite comparator function, which can be set at resistance and voltage values to get the reliable detection of battery deterioration. » Pin type lead, which can easily contact the battery electrodes supplied as standard to get more accurate 4-terminal measurement. » Clip type lead with temperature sensor. » Clamp adaptor for DC current measurements.